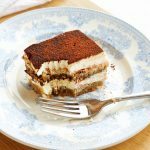 This No Bake Tiramisu Icebox Cake is an easy-to-make version of the Italian classic, but it's just as delicious as the original! Add the Mascarpone cheese, cream cheese, and vanilla extract to a large bowl and whip on high speed with an electric hand mixer or stand mixer. Add the powdered sugar and continue to whip on high speed until combined. Gently fold in the whipped cream with a rubber spatula until it's well combined and the mixture is light and fluffy. Add the rum or rum extract to the coffee and dip the ladyfingers in the coffee mixture one by one until you've lined the bottom of a 9-inch by 13-inch pan. Smooth half of the Mascarpone mixture over the bottom layer of coffee-soaked ladyfingers and dust the top of the Mascarpone layer with cocoa powder. Add another layer of coffee-soaked ladyfingers over the cocoa-dusted Mascarpone layer and then top with the remaining Mascarpone mixture, smoothing it out as much as possible. Dust with the remaining cocoa powder right before slicing and serving.